Now that the Mayan calendar’s 14th Baktun has started with no hitches, it seems that there’ll be a 2013 after all – and the really good news (assuming the Values Institute at DGWB is better at predicting things than doomsday sites) is that food waste consciousness will be the top 2013 trend (with “meatless mainstreaming” coming in at number 4). Beth Hoffman, in an article she wrote for Forbes, seems to concur, listing food waste, humane animal treatment and food labelling as three issues of great importance that have finally made it into mainstream American consciousness. So, now that we’re all on the cusp of heightened food waste consciousness, I expect a few people will want to be making New Year’s resolutions to waste less, and if you’re looking for ways to do that, this article on CNN.com is a good place to start. One food that the CNN article doesn’t mention, is citrus peels. Peels almost inevitably get wasted, which is a shame, because a little zest can add a great accent to sweet and savoury dishes, mulled beverages, teas, chutneys, pickles, cocktails and more. So why do so many peels end up in the bin? Simple: people rarely have cause to use citrus peel on the same day that they use the fruit … and on days that they do use zest, they often end up wasting the fruit. 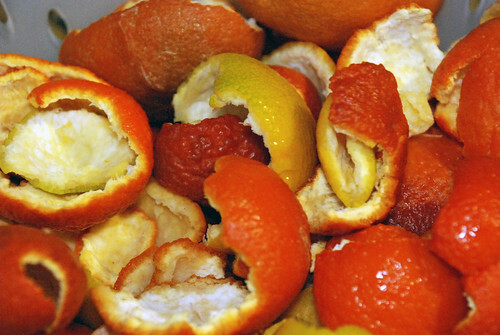 In 2012, we decided to do something about that in our home, and started freezing peels whenever we ate citrus fruits. That provided us with a handy supply of zest throughout the year, with a big surplus at year end – perfect for making holiday candy. We made our candied peels with some brandy, cinnamon, star anise, and cloves. The peels last for several months, and are versatile. They can be used in baking or as garnish, eaten straight or dipped in chocolate – and make a nice seasonal gift during the holidays. The extra bonus was the simple syrup infused with spice and citrus that was a byproduct of the process. It came in handy when we opened a bottle of red wine that was not as tasty as we’d hoped. We heated up the wine, and added one tablespoon of brandy along with two tablespoons of our new instant Glühwein syrup (patent pending) per serving – and, just like that, bad wine was transformed into very Christmasy mulled wine. I’m guessing the syrup will also be good for making spiced tea and cider. Thaw peels (if needed) and slice into various shapes. 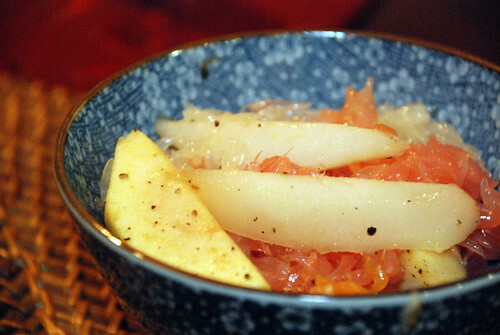 We used a combination of thawed orange, blood orange, lemon and lime peels, as well as the fresh peels of a red pummelo and an oroblanco grapefruit Bonnie Lee had just used in a savoury fruit stew. The fresh peels were very thick with pith, and ended up having a texture similar to gummy bears, with great grapefruit notes. Submerge peels in water, and bring to a boil. Drain. Repeat. Repeat again. This removes some of the bitterness from the pith. Mix sugar and water. Boil for 10 minutes or so, until the syrup reached the thread stage (i.e., until syrup dripped from a spoon into cold water forms thin threads). 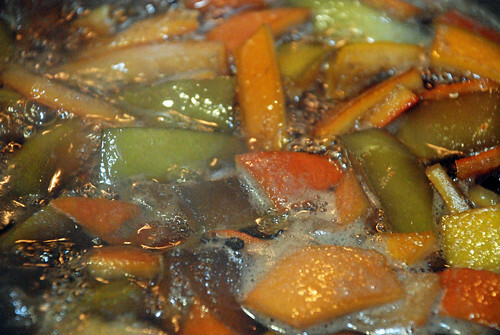 Add in the brandy, cloves, cinnamon, star anise, and peels, and simmer until the pith is translucent. This took about 2 hours for our batch. Let peels dry on wire rack until they are no longer sticky (this can take up to a day). 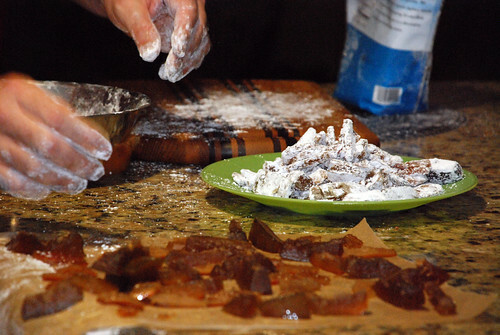 Roll peels in sugar, if desired. The fruit stew that sparked the candy making. This entry was posted in On food waste, Waste less recipes and tagged apocalypse, blood orange peel, candied peel, citrus, food waste, freeze, freezer, Gluhwein, grapefruit peel, green living, lemon peel, lime peel, Maya, mulled cider, mulled wine, orange peel, pummelo peel, recipe, resolution, sustainability, sustainable living, trend, wasted food, zest by Jean-François. Bookmark the permalink. They look very tasty. I like the idea of saving the citrus peels and freezing them too. I use a lot of zest in cooking. 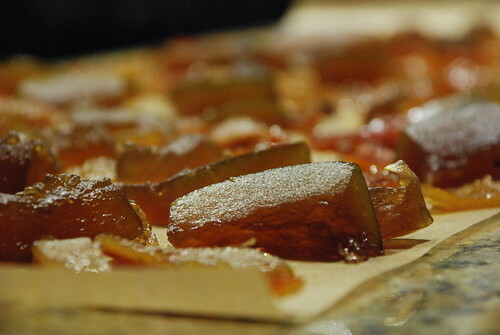 Thanks – the only “problem” is that we have a lot of candied peel now. Fortunately, it freezes well, and we have one friend who’s planning to use a lot of them in her muffins. Clicking links now. You rock. Thanks – happy to New Year to you too. I guess it’s no surprise that we don’t like to waste wine more than anything else. 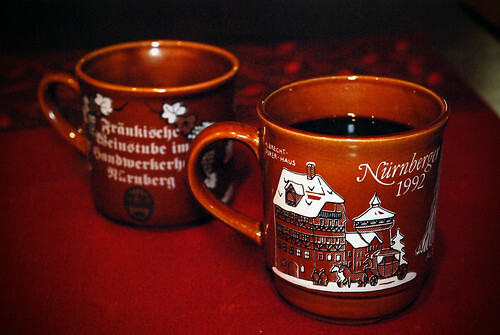 In the winter, bad wine becomes Glühwein, and in the summer, Sangria. PS: I’m with Shannon here in cheering on that EXCELLENT news you open with in your first paragraph.. Hooray! Thanks so much, Gina. And, yes, the news is wonderful. Hopefully all this awareness will shift habits in the right direction, and inspire some creative solutions like http://www.rubiesintherubble.com. You are such a clever chap. I would never have thought to freeze peel, but after reading this I will definitely save most peels. I already have a small ice cube tray with various zests in to add to pasta (so zingy even after freezing) and baking, but never the whole thing. The syrup/candied idea is good too. Must go out and buy some rubbish red wine to have occasion to try the leftover syrup! I would hate to think I’ve inspire anyone to buy rubbish wine. That being said, there’s no reason to throw the stuff out when it enters your life uninvited.